DA perfect crystal is an ideal crystal that doesn’t found in nature. The arrangement of the atoms in the ideal crystal follows certain rules very well that result the ideal arrangement of the atoms. But in the real material, the arrangement of the atoms does not follow the ideal crystalline pattern. The Clear fact is that there is no material which is perfect crystal. Alone the crystal structure and the composition of the material were enough to dictate the properties of the crystal if the material were perfect crystal. If it was so then the material would be very restricted to their value and variety. As we know that there is a possibility of making the imperfectly crystalline material that gives the material scientist to alter material properties into diverse combinations that modern engineering process required to build the product as per the requirements. There was a scientist called Volterra who introduce the concept of dislocation in the nineteenth century. Dislocation was observed directly using the technique of transmission of electron microscopy and X-ray topography. Dislocation affects the many aspects of the physical behaviour of the material. Dislocation of the atoms from their specified place to some other place is called the dislocation in the crystal. 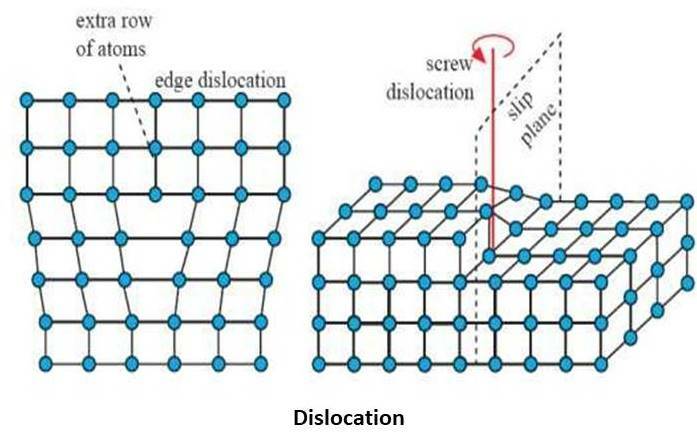 Dislocation is a type of defect found in the crystal structure. When the load is being applied on the body it gets deform and the dislocation generated in the crystal structure. This dislocation leads to slip in the crystal and the plastic deformation to occur. As the name suggests, the edge of the crystal gets dislocated from their original position. Edge dislocation is due to the displacement of atoms from the front to the back face of the crystal structure. When the extra half plane of an atom is being inserted to the crystal it results in the Edge defects. There are two displacements found in the crystal, negative and positive and it is denoted by ‘T’ and inverse “T” respectively. In these defects, the Burger’s vector is perpendicular to the dislocation line. Every material has their own properties alone. But due to the edge dislocation, metals possess high plasticity, ductility and malleability nature. The movement of the dislocation across the plane eventually causes the top half of the metal to move with respect to the bottom half in the crystal. Burger vector: when the dislocation of the atoms takes place in the crystal. The magnitude and the direction of the displacement of the atoms in a crystal are defined by the vector, this vector is called as Burger Vector. When the displacement of the atoms is from the right face to the left face of the crystal, then this dislocation is called a screw dislocation. In the screw dislocation, the burger vector B is parallel to the dislocation line. There is a big difference between the edge and screw dislocation, in the screw dislocation geometry changes, also the material gets deform plastically. Slip is one of the important mechanisms of the plastic deformation in the material basically metal. When the one plane is slide over the other plane along a definite crystallographic plane. 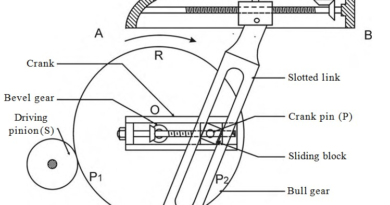 When the shear force is applied on the metal and this applied force exceeds their limit then slip occurred. All the Engineering materials are polycrystalline; in this case, the slip involves generation, movement and rearrangement of dislocation. As the name implies that the interconnection of two crystal. Twinning occurs in the crystal due to the crystal growth of the two separate crystals. They share some of the same crystal lattices in a symmetrical manner. 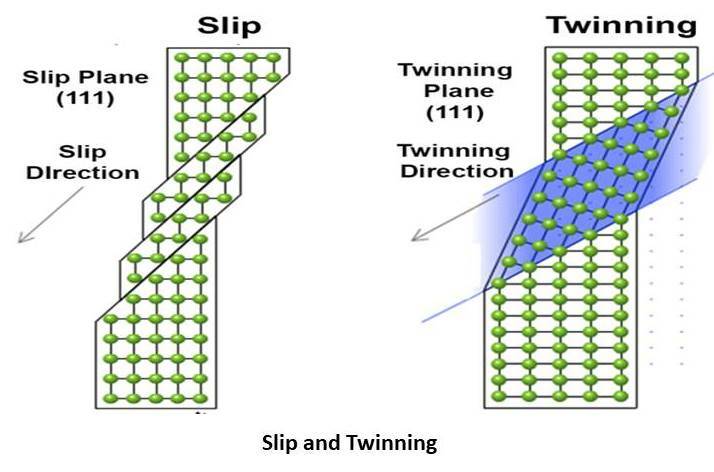 When the two crystals get together and share their crystal lattice, a twin boundary surface separates the two crystals. Scientist classifies it by the number of twin law. This are basic about line defects like dislocation, slip and twinning. If you have any query regarding this, ask by commenting. If you like this article, don’t forget to share it on social networks. Subscribe our website for more informative articles. Thanks for reading it.